Jogi is a colloquial term for the "yogi", which refers to the people who practiced Yoga as part of their daily rituals. Over time, this led to the formation of a community. At one time Jogis were from one family lineage, but they now include people from various castes. 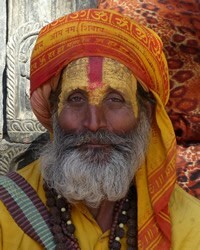 As followers of the yoga, they traditionally wear saffron-colored clothing. The Jogi are made up of purely religious mendicants (i.e., beggars) of the various Jogi orders, various people who live by fortune telling, practicing exorcisms and divination, and others. In Muslim Bangladesh, these caste Hindus stand out. Most likely Muslims in Bangladesh feel that such people are a threat to having Bangladesh be a pure Muslim land. By far the most Jogis live either in India or Pakistan, but there are some in Bangladesh as well. This is a people group that lives very impoverished lives. They live by entertaining and begging, providing a spectacle for others. Many Hindus look up to the Jogis. Jogis are usually very interested in spiritual matters, or they would not be willing to live in such poverty and uncertainty. The Jogi are worshipers of the Hindu god Shiva. The Yoga system of philosophy taught the means whereby the human soul might attain complete union with the Supreme Being. The modern Jogi, speaking generally, claims to have attained that union and to be, therefore, a part of the Supreme. The Jogi community needs to understand that they are wasting their lives without performing a needed task, and that they need to dramatically change how they think and act. * Pray the Jogi will be able to find employment to enable them to improve their standard of living. Pray they will be able to escape a begging mentality. * Pray that there will be many Christian workers called by God to take the gospel to the Jogis in Bangladesh. * Pray for the Holy Spirit to touch the hearts of the Jogi people in Bangladesh in such a way that they will understand that they must submit to the risen Christ. 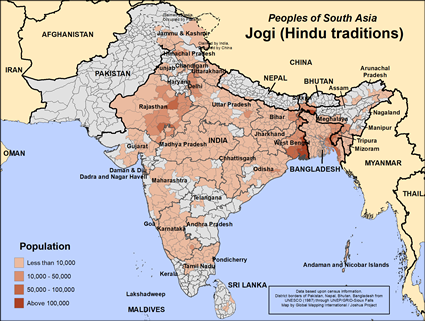 * Pray that the Lord will use the Jogi people to spread His word in India and Bangladesh. http://www.dawn.com/news/1224299View Jogi (Hindu traditions) in all countries.